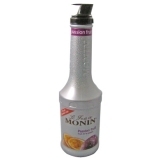 Monin Passion Fruit syrup 70cl in stylish glass bottle. Passion fruit is one of the most intensely and enticingly scented of all fruits. Cultivated in many tropical and temperate regions in the Americas, North Africa and Australia, the passion fruit is known by many exotic sounding names, including Chinola, Parcha, Lilikoi, Granadilla, Sweet Cup and many more. Passion fruit is likely the most recognised name of the fruit. The fruit's pulp features a very distinctive exotic flavour and a bright orange colour. 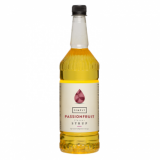 Use easy to pour, convenient Monin Passion Fruit to impart ripe, juicy flavour and a tropical, exotic bouquet to your cocktails and non alcoholic beverages. Taste: Exotic fruity aroma, sweet and sour taste which will make you feel like eating fresh passion fruit. Applications: Sodas, lemonades, cocktails, fruit punches, smoothies, cold cocoas. Sugar, water, concentrated passion fruit juice and other fruit juice, colouring agent: E161b, flavouring, emulsifiers: acacia gum, ester gum. Total fruit juice: 29% minimum including 10% passion fruit juice. 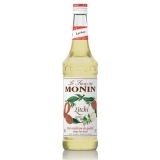 Sorry - We are out of stock of Monin Syrup - Passion Fruit (70cl).